When you meet someone new, through daily life, at work, or as a doctor seeing a patient, you form an immediate impression of that person. Over time, you get to know that person better by becoming familiar with their habits, quirks, and mannerisms. 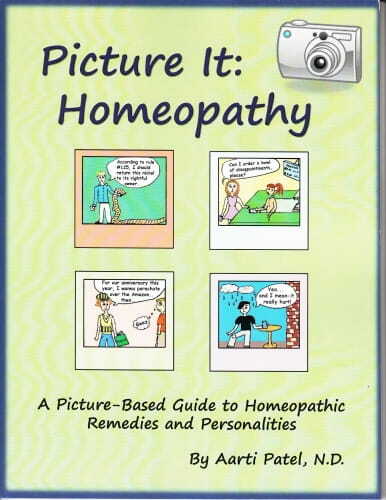 "Picture It: Homeopathy" combines both of these characteristics in learning about people through the study of homeopathy, providing picture-based snapshots with in-depth descriptions of 32 common remedies and their personalities. Whether you're a student studying homeopathy or just interested in learning what homeopathy is all about, this unique and imaginative book offers a fun and exciting way for you to learn. Combining visual artistry with clear, concise descriptions, "Picture It: Homeopathy" makes the study of this fascinating medicine accessible to everyone. In a relaxed and humorous tone, Dr. Patel brings the study of homeopathy, and thereby people, into a fresh new light.